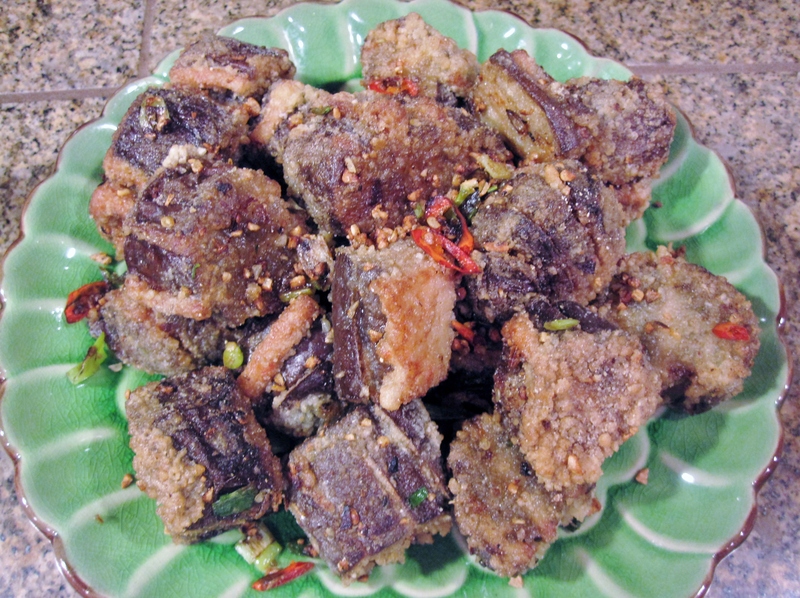 I saw this recipe on Spicy Delicacies 惹味香辣菜. The eggplants look so delicious on the picture, and I was determined to give it a try. This is by far the best eggplant dish I have ever made (anything fried and seasoned with salt pepper flavor is of course delicious! 🙂 ), and Richard gives it a thumbs up. However, it’s quite a process– first steaming, then frying and lastly toss in the wok… I don’t think I’ll be making it often, unless I’m desperately craving for it. Slice eggplants horizontally into 1/2 inch thick. Soak in salt water to prevent discoloring. Drain and pat dry with paper towel. Sprinkle a little cornstarch on EACH cut side, spread some shrimp paste and layer with another slice of eggplant. Repeat with the remaining shrimp paste and eggplant slices. Steam eggplant sandwiches on high heat until cooked, about 5-8 minutes. Let cool, then slice into 1 inch thickness ( I used toothpicks to secure the eggplants before slicing). Coat eggplant sandwiches with beaten eggs then tapioca flour. Let eggplant sit for a few minutes to absorb tapioca flour (so less flour crumbs drop into the oil during frying). Deep fry over medium heat until golden brown. Set aside and drain. Heat oil in a pan. Saute garlic and red peppers until aromatic. Add eggplant sandwiches, green onion, salt and pepper. Stir fry quickly. Dish out and serve immediately. Shrimp paste: Instead of buying from store, I just used about 2 rice bowl full of shrimps, shelled and deveined, then blend in food processor (adding some salt, ground white pepper, cornstarch, cooking oil and a little egg white). It’s not the best shrimp paste, but salt and pepper flavor makes everything taste incredibly delicious!